FD-302 reports listed here are interviews of the person named, except as noted. Views expressed on INTELWIRE are those of the author alone. INTELWIRE is a web site edited by J.M. Berger. 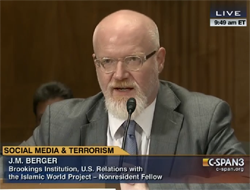 a researcher, analyst and consultant covering extremism, with a special focus on extremist activities in the U.S. and extremist use of social media. He is a non-resident fellow with the Brookings Institution, Project on U.S. Relations with the Islamic World, and author of the critically acclaimed Jihad Joe: Americans Who Go to War in the Name of Islam, the only definitive history of the U.S. jihadist movement, and co-author of ISIS: The State of Terror with Jessica Stern.